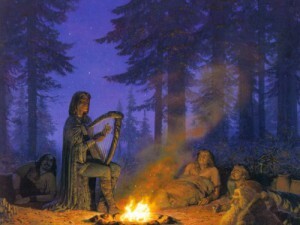 Finrod Felagund and the people of Bëor; art by Ted Nasmith. In this new TORn Library feature, Dr Timothy Furnish explores a lesser-known, but important, philosophical treatise from The History of Middle-earth and speculates whether J.R.R. Tolkien may have doing more than “merely” evoking Christian myth. Much has been written in the last half-century on J.R.R. Tolkien as a Catholic writer and on Christian themes in his various tales of Middle-earth, especially The Lord of the Rings; to name but a few of the most prominent examples: Frodo as a suffering Christ-like figure; Gandalf as a dying but resurrected type of Christ; lembas as consecrated bread; Galadriel ‘s similarities to Mary; Aragorn as the pious and noble ruler who vanquishes evil and heals the land; and, in general, the constant reminder that “there are other forces at work in this world… besides the will of evil.” But Tolkien went beyond mere symbolism or figurative hinting at Christian theology and actually embedded the prophecy of the Incarnation within Middle-earth’s history, in “Athrabeth Finrod Ah Andreth” (“The Debate of Finrod and Andreth”) found in Morgoth’s Ring: The Later Silmarillion, Part One: The Legends of Aman (Houghton Mifflin Company, 1993), pp. 303-366. The Elven King responds that “these things are beyond the compass of the wisdom of the Eldar, or of the Valar maybe”—the Valar being the archangelic beings who, in the First Age, still dwelt in Valinor, to the west of Middle-earth—while also avowing that “if Eru wished to do this, I do not doubt that He would find a way.” Finrod goes on to admit that “I cannot conceive how else this healing could be achieved” since “there is no power conceivably greater than Melkor save Eru only. Therefore Eru, if He will not relinquish His work to Melkor… must come in to conquer him.” He also marvels that “no such hope was ever spoken to the Quendi” [the Elves’ name for themselves]” and was in fact given only to mortal Men. The 1951 letter to which the younger Tolkien refers is one to Milton Waldman of Collins Publishing, the relevant part of which is that Tolkien critiqued the Arthurian legend for being too explicitly Christian: “that seems to me fatal. Myth and fairy-story must, as all art, reflect and contain in solution elements of moral and religious truth (or error), but not explicit, not in the known form of the primary ‘real’ world” (Humphrey Carter, ed., The Letters of J.R.R. Tolkien, Houghton Mifflin, 1995, p. 144). How might we read this riddle of Incarnational prophecy in Middle-earth? Did J.R.R. Tolkien change his mind about the error of making Secondary World theology resemble overmuch that of the Primary World? Or did he perhaps feel that giving the Elves some glimmer of redemptive hope would lessen their dread of the future: “beyond the ‘End of Arda’ Elvish thought could not penetrate, and they were without specific instruction… They said therefore that Men had a shadow behind them, but the Elves had a shadow before them.” Then again, maybe the creator of Middle-earth simply let his Catholic faith get the better of him and overrule his literary governor. Perhaps it is wise not to delve too deeply into such matters. Rather, let us simply rejoice in the notion that the Dominion of Men ushered in by Aragorn as King Elessar does not merely refer to the political and demographic supplanting of the other races by humans, but to the realization of God’s salvific plan for all sentient creatures through one Man. Thus, it is worth considering that Christ’s “other sheep…not of this fold” (John 10:16) might refer to Elves (and Dwarves, and Hobbits), if they ever did exist; and that the Son of Eru whose birth we celebrate on December 25th died and rose for them as well as for all Men and Women. Happy Yule/Merry Christmas! Timothy R. Furnish is a PhD in History (Islamic, World and African) and also holds a M.A.R. in Christian theology and history. His book Glorious Warriors And That Which They Defend: War and Politics in Middle-earth’s History should be out from Oloris Publishing in spring 2014.